Ce document au format PDF 1.7 a été généré par Elsevier / Acrobat Distiller 8.1.0 (Windows), et a été envoyé sur fichier-pdf.fr le 17/04/2015 à 12:08, depuis l'adresse IP 85.69.x.x. La présente page de téléchargement du fichier a été vue 519 fois. Taille du document: 303 Ko (9 pages). this clinical dichotomy using a cognitive psychopathological approach. on extensive Piaget-like tasks was also performed in an additional small group (n ¼ 12). France. Tel. : þ33 2 31 27 23 09; fax: þ33 2 31 27 24 03. 1090-3798/© 2015 European Paediatric Neurology Society. Published by Elsevier Ltd. All rights reserved. p &lt; 0.05); and 3) an increased prevalence of pathological cognitive disharmony on Piagetlike tasks (87.5% versus 0.0%; p &lt; 0.05). further investigation of this profile. after examination by trained psychiatrists and psychologists. p &lt; 0.05), other comparisons showed no significant difference. gifted children with and without a SVPD, using chi-square tests. more prevalent in the non-SVPD group. giftedness compared to intellectually homogeneous ones. investigations of self-concept and metacognition in developmentally asynchronous children with intellectual giftedness. Table 1 e Proportions of children with significant R-CMAS scores across SVPD and non-SVPD groups. 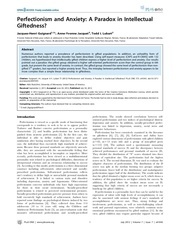 psychopathological assessment in children and adolescents. and without a SVPD, using the Chi-square test. SVPD and non e SVPD groups. c2 ¼ 4.11; p &lt; 0.05.
emotional and behavioural problems which may be earlyrooted in development. Echelle de D eveloppement de la Pens ee Logique61). SVPD, using Fisher's exact test. reasoning or other executive resources. its association with pathological cognitive disharmony. SVPD than others (87.5% versus 0.0%, respectively; p &lt; 0.05). 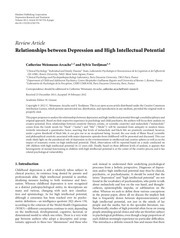 relevant variable, which contributes distinguishing two subgroups within referred children with intellectual giftedness. abnormalities involving mild interhemispheric disconnection/lack of hemispheric lateralization or right-sided neurological soft signs. a “high-functioning pathological cognitive disharmony”. emotionally talented and atypical subtypes of high intelligence should be investigated in future research. perspective and with long-term purposes. children using measures of intelligence or cognitive abilities. York: Springer; 2008. p. 161e76. children. Int J Pediatr 2011;2011:420297.
study. J Sch Psychol 1986;24:55e61. epidemiologic literature. Gift Child Q 2010;54:31e41. adaptatifs. Neuropsychiatr Enf Adolesc 2011;59:327e35. clinically referred children with intellectual giftedness. a paradox in intellectual giftedness? PLoS One 2012;7:e41043. youth. Gift Child Q 2009;53:34e49. the evolution of society. Roeper Rev 1994;17:110e5. “different”. Gift Child Q 1985;29:78e82. 16. Shaywitz SE, Holahan JM, Freudenheim DA, et al. 18. Silverman LK. The construct of asynchronous development. children. Gift Child Q 2006;50:7e10. and Adolescent Psychiatry and Allied Professions; 2012.
l'enfant. J des Prof de l'Enfance 2003;24:37e40. l'intelligence troubl ee. Paris: Dunod; 2009.
neo-Piagetian perspectives. Mahwah: Erlbaum; 2008. DC: American Psychiatric Association; 2000. 31. Spielberger CD. Anxiety: currents trends in theory and research. New York: Academic Press; 1972.
high IQ children. Gift Child Q 1985;29:125e30. relationship. Gift Child Q 1993;37:105e12. Acad Child Adolesc Psychiatry 2010;11:1105e16. study. J Child Psychol Psychiatr 2011;52:139e47. 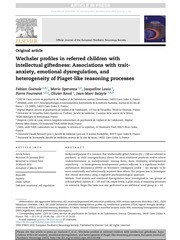 Am Acad Child Adolesc Psychiatry 2011;50:807e17. 46. Achenbach TM. Manual for the child behavior checklist/4-18. psychiatrie de l'enfant. Psychiatr Psychobiol 1988;3:409e18. screening instruments. Psychol Med 1989;19:777e95. optimal cut-off. J Child Psychol Psychiatr 1991;32:677e93. societies. 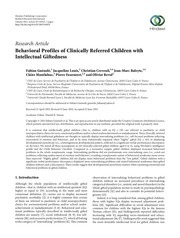 J Clin Child Adolesc Psychol 2007;36:405e17. Acad Child Adolesc Psychiatry 1987;26:207e13. dysregulation in children. Biol Psychiatry 2006;60:991e7. York: Cambridge University Press; 1987.
childhood to adolescence. New York: Basic Books; 1958.
homogeneity index. J Adolesc 1983;6:109e30. adolescence. New Haven: Yale University Press; 1992.
giftedness. Creat Res J 1998;11:347e55. development. Educ Able Child 2002;6:21e7. natural phenomena. J Exp Child Psychol 1997;67:90e113. and reasoning. Hove: Psychology Press; 2013. p. 49e70. pervasive developmental disorders. Hoboken (NJ): Wiley; 2005.
spectrum disorder. J Autism Dev Disord 2012;42:1781e9. Farah MJ, editors. Behavioral neurology and neuropsychology. New York: McGrawth-Hill; 1997. p. 789e94. rehabilitative treatment. Ital J Pediatr 2010;36:64.
functions. J Exp Child Psychol 2010;106:1e19. reasoning development. Psychol Sci 2013;24:87e92. 91. Simoes Loureiro I, Lowenthal F, Lefebvre L, Vaivre-Douret I.
potentiel: etude exploratoire. ANAE 2009;102:188e94. Sternberg RJ, Davidson JE, editors. Conceptions of giftedness. New York: Cambridge University Press; 1986. p. 53e92. empirical studies. J Child Psychol Psychiatr 2012;53:469e89. dimensional approach to developmental psychopathology. Int J Methods Psychiatr Res 2007;16:S16e23. disease. J Med Philos 2008;33:106e39. Ce fichier a été mis en ligne par un utilisateur du site. Identifiant unique du document: 00320754.